The Summerside Law Courts building is a 3 storey red brick Italianate style structure located on landscaped grounds punctuated with large trees in the City of Summerside, PEI. 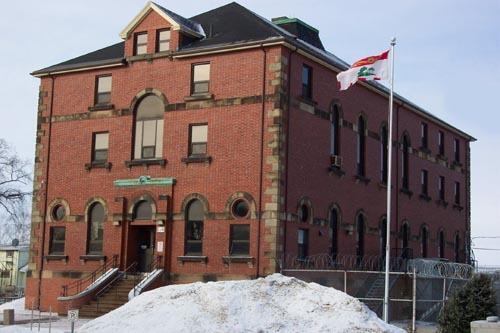 The heritage value of the Summerside Courthouse emerges from its brick Italianate architectural style which was constructed in 1873, the same year PEI joined the Canadian confederation as the seventh province of the Dominion. Another aspect of its heritage value is its location as a prominent government building in Summerside. When it was built here, it heralded the replacement of nearby St. Eleanor's by Summerside as the county seat of Prince County. The site of this building was donated by Joseph Green, the son of a Loyalist pioneer in the area. It was part of a green space or parkland that Green had given to the new town. The courthouse was designed to include both judicial chambers and a jail all within the same building - much to the chagrin of some of the residents of the area who did not want "an unsightly prison" in their backyard. The building was designed by John Corbett and built by Thomas Beattie, who also built the Indian Head lighthouse at the entrance to Summerside's harbour, the only other example of Beattie's work to survive. The new court was presided over by William Henry Pope, who became its first judge and also was a Father of Confederation. The building was rebuilt after being ravaged by fire in 1906. It actually had helped preserve all the wooden buildings north of it be forming a shield against the flames. As such it stands as a symbol of survival and renewal for the City of Summerside and a link to its past. The original building was later renovated with the addition of a third storey in the 1930s. Most recently, it was made more publicly accessible in all respects. It still serves as a courthouse.